At the time, the Vision Video company were selling the full collection of Hal Roach movies over 21 video cassettes. I had most of them and on the back there was an address to contact if one wanted more information about a society called the Sons of the Desert.. I contacted the man in question who turned out to be Rob Lewis, Grand Sheik of the Helpmates Tent in Kent. He placed an advert for me in his Laurel and Hardy magazine and we were off. I had to contact the main HQ in America and Scott MacGillivray, author of "From the 40’s Forward", sent me the details of forming a Tent. At the time, the Exhausted Ruler John McCabe had decided that non-USA Tents were not real Tents and only American Tents could be members of The Sons of the Desert!! There had been uproar at this and the non-American Tents were quite upset. Unfortunately, as Exhausted Ruler, John McCabe ruled the roost.... Eventually a compromise was made and it was decided that each Tent, no matter from where it came, MUST have at least 5 subscriptions to the Intra Tent Journal, in order to be an official Tent.. Meanwhile, my advert in Rob Lewis’s magazine had proved worthwhile as I received a letter very soon afterwards from none other than Steve O’Connor, would-be Irish Rugby Team player!!!! He wanted to support any Irish Tent and was on board to join the Intra Tent Journal (ITJ) too.. Steve is still a member today despite all efforts to lose him! We became something of a nomadic Tent, moving from venue to venue, depending on room hire prices... The Central Hotel hosted us first and the bill for our first meeting there came to £400.... Room hire and equipment hire.... We charged an entrance fee and came up short by £250!! We also used to travel Northwards to cater for our Northern Ireland members. Noel Spence had a cinema in his back garden. Art Deco style and fantastic... He hosted us for a tiny fee for 4 years. We kept going and over the years moved to The Academy Hotel, The Harcourt Hotel, The Royal Marine Hotel and The Paramount Hotel.... All charged us for room hire and although we had invested in projection equipment, there were still some scary nights when numbers were down and the door was short..... We had some amazing members and some great support...you know who you are..
Thankfully we have settled in our current venue in the RTE social club, it only took us 13 years! It took us a while, but we eventually began attending conventions. Strangely enough, the first one was our own! 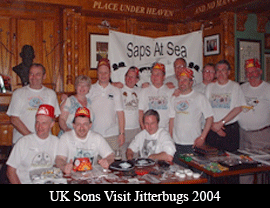 Yep, some Sons from the UK visited us in 2004 and the idea was put to me by a certain Eric Woods about hosting the 2007 European Convention.. I had no idea what was involved. 3 years later and we managed to pull of a very successful weekend where we hosted 85 Sons of the Desert in Dublin for the 8th Euro Convention. That is a feather in our cap. The Sons are an unusual lot of people. They are a family and a loving one at that. I have never met such a fantastic bunch of people. Real people and real friends. 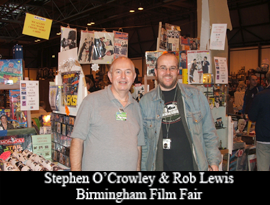 At the Birmingham Convention in 2012, I was at the bar and after a minute another Son stood beside me. Eventually the barmaid came down and attended to him first. "No, this gent was here first", came the reply in a Scottish accent. "Thank you", I replied... "No need", he said. "We’re Sons and we don’t do that to each other". It has been time consuming like you could not imagine. Especially with an growing and increasing family. 13 years ago I had a daughter. Now I have 3 and 2 sons. My Sons life is special though and I would not change it for the world. The next attendance record goes to Stephen O’Crowley... Our Vice Sheik. Without him there would not have been a convention in 2007. His back up and support is unbelievable. He has been a rock and kept me going when I wanted to give up... He probably doesn’t know that. We’ve become good friends and I love his sense of humour as it is so like mine... One in a million. Steve, the rugby wannabe.... "What a guy".... You know your contribution....say no more, or you’ll get a big head you git. Colin..... You probably don’t realise it but, you too have an annoying way of making me WANT to carry on, when I feel like jacking it all in. I appreciate and relish your support like you could not believe. You are one of life’s good men, I enjoy your company and I count you as a friend. Here’s to the next 13 years guys.... It’s only a laugh..
©LaurelandHardy.ie - all Laurel & Hardy images © copyright CCA. ©Jitterbugs Logo Images - Tony Bagley.